A long time ago, the government, after it created the income tax via constitutional amendment, enacted a payment withholding policy. Every paycheck, you set aside money for the government, anticipating how much you'd give. The goal is that you don't have to give the IRS a big lump sum at the end of the year because Americans are bad at budgeting for that. 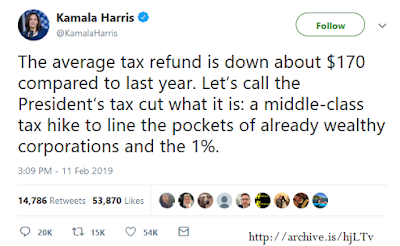 That bad at budgeting part is what the government and politicians like Kamala Harris are banking on. The refund you get from the IRS is if you've withheld too much money and given the IRS more money than you owe them. They give it back to you. You can choose with your employer how much money to withhold per paycheck by choosing to have no or a bunch of “allowances” on the “Form W-4”. You could give 100% of your money to the government (via the “Additional amount, if any, you want withheld from each paycheck” field on the W-4) and get a huge refund one time a year! The amount of money you get from the government by tax refund is not a measurement of how much more or how much less in taxes you owe. If you understand personal finance, the goal is to not have any tax refund. The extra money given to the government isn't put into a savings account and it does not accumulate interest. That tax refund money, in-between you having it taken out of your paycheck in the form of payment withholding and when the tax refund occurs, is you giving a short-term, interest-free loan to the government. If anything, the amount of money people owe to the IRS would be less because their taxes are less, reflected in the changed withholding tables created after the tax cut passed. It's financially much better to keep more of your money per paycheck and invest it. Or pay your bills with it, or buy videogames with it (save $5 for the Challenger Pack 2 with Phoenix Wright in Super Smash Bros. Ultimate! ), or whatever. More money means more freedom. Kamala Harris knows this. And hopefully she knows, as someone who has been a part of government for many years and votes on tax policy, that tax refunds aren't a measure of the effect of tax cuts. Introducing: Komala Harris. Because Kamala and Komala have a lot in common besides the naming. They both have the ability to be completely Comatose but otherwise aware at the same time. This is handy for Komala in that it can't be afflicted by status conditions, but Kamala uses it to be cognisant of her surroundings and appear normal, but otherwise have a totally shut-down mental process. Again, she's either really stupid or a total liar. Perhaps even both. Both Komala and Kamala naturally learn Rapid Spin. This allows Komala to clear hazards off that team's side of the field, and allows Kamala to quickly provide a biased version of reality that happens to match her predetermined beliefs. Both Komala and Kamala are fond of a natural diet. Komala almost exclusively eats leaves that can provide sedative properties if processed right. Kamala has claimed to be a user of marijuana, another green natural plant that provides sedative properties if processed right. Finally, both Komala and Kamala naturally learn Slam. Komala uses this to slam its log pillow at people, while Kamala used this to slam prison sentences to at least 1500 people (and very likely much more) on marijuana-related offenses as California Attorney General, the same marijuana that she claims to have indulged in. 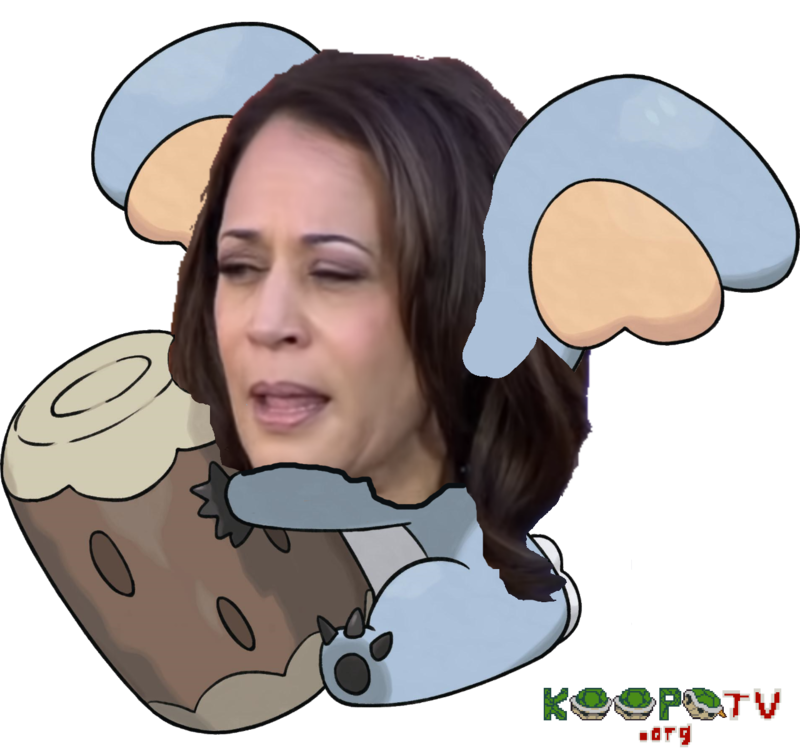 Komala and Kamala are basically the same, and that's not good for the United States of America. If payment withholding and the whole income tax system bothers you, then perhaps you'd be interested in the FAIRtax, a tax system that would abolish the IRS and the federal income tax, and would replace it with a national consumption tax. Read more about the FAIRtax here. Criticising President Donald John Trump's tax cut as continuing the income tax system that is abusive to Americans is a fair criticism; lying about how tax refunds work is not, and may get a negative KoopaTV article against you. Please behave accordingly. When Komala was a newly-announced Pokémon, Ludwig claimed it stole Timburr's log. He also liked it. Yes. It's better to owe taxes than to get a refund (as long as you don't owe too much). Refunds might look like a good thing on the surface, but you could have kept that money and had it earning interest instead! It's not FUN to pay the taxes you owe, but it's better. Well, only GameStop thinks that paying taxes would be fun, and you can look at their stock price recently to see how that's going.